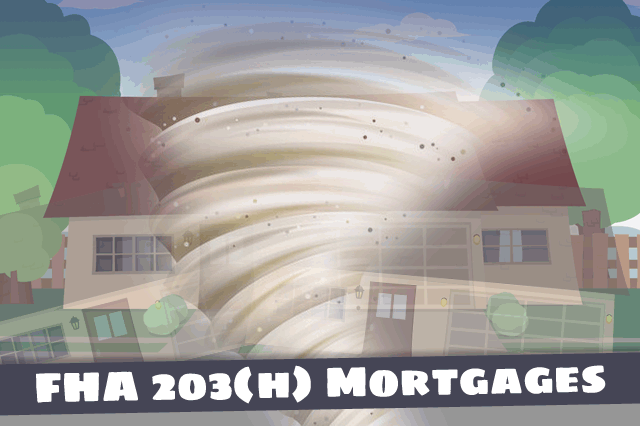 What are the FHA loan rules for 203(h) mortgages for disaster victims? HUD 4000.1, the FHA Loan Handbook, has the basic rules and requirements for these loans which are made available to those recovering in federally-declared disaster areas. May 30, 2018 - What are the FHA loan rules for 203(h) mortgages for disaster victims? HUD 4000.1, the FHA Loan Handbook, has the basic rules and requirements for these loans which are made available to those recovering in federally-declared disaster areas. The FHA Loan Handbook defines these mortgages as available to single-family home owners (who must be owner/occupiers) to buy or rebuild a home in a Presidentially-Declared Major Disaster Area or PDMDAS. The borrower’s original home must be located in these areas as defined by the Federal Emergency Management Agency (FEMA).The FHA does not assign these declarations, it simply issues loans in affected areas as defined by FEMA. FHA guidelines specify a minimum credit score of 500. Lender requirements may also apply in addition to the FHA loan minimum. Borrowers should expect to work closely with the loan officer to establish the causes of such credit issues. You may need to provide supporting documentation including personal statements, financial records, or other evidence to establish when and how credit problems caused by a natural disaster were created. It’s understood that a borrower’s personal records may not have survived a disaster, but FHA loan rules permit supporting documentation from sources such as the IRS or other agencies to take the place of the applicant’s personal files. Lender standards will also apply. These FHA home loans for disaster victims can be used in conjunction with other FHA mortgages such as an FHA 203(k) Rehab Loan. Certain requirements (see below) may apply when using the FHA 203(h) loan for disaster victims together with the 203(k). In other words, the 203(k) rehab loan down payment requirements will apply in such cases.